The history of American religion is far weirder than most people realize. This nation’s landscape was once chock-full of esoteric organizations and secret societies. The Freemasons (who aren’t American in origin but who found fertile soil in America) are obviously the most well-known, but there were many others, including some that are still around today. One of those still-existent organizations is called the Church of Light. The CoL is an interesting group in its own right, with a strong emphasis on astrology. It was established in Los Angeles on November 2, 1932, purely for the sake of circumventing a newly passed ordinance against the teaching of astrology. Today, the church live streams their lessons and services online, and their physical headquarters exists at 2119 Gold Avenue, Albuquerque, New Mexico. All interesting stuff, for sure, but of greater relevance today is the organization the CoL grew out of: The Brotherhood of Light. I hadn’t heard of either of these groups until I stumbled upon this Ancient Masonry — Royal Arch booklet at a book sale. The book is intriguing enough as a historical artifact, but I started really slobbering when I got home and started to research the organizations and names mentioned in the booklet. The book gives me another piece to the puzzle of America’s weird history. The only problem is that the image being put together is more nebulous than the scattered pieces were. Though apparently no different than the CoL, the Brotherhood of Light is more intriguing (in my opinion) simply because it was a secret society. The Brotherhood was established in 1915, a product of C.C. Zain, a pseudonym (or perhaps magickal name) for a gentleman named Elbert Benjamine. Benjamine was also associated with the Hermetic Brotherhood of Luxor (HBL), whose members overlapped with the Theosophical Society of Madame Blavatsky. These names are going to immediately mean something to those readers who share my weird interests. To those who don’t, trust me when I say they are all extensive subjects in their own rights and it’d take a novel if I’m to stop off at each one. So, the HBL asked Benjamine to compile a series of books that would make occult knowledge and the methods of spiritual initiation available for the public. Image from inside the booklet. Zain completed the task of writing the Brotherhood of Light lessons between the years 1910 and 1950. They were published by a Denver-based company named Astro-Philosophical Publications, which was run by members of the HBL. The copy I’m discussing here, as the main image of this article shows, is titled Ancient Masonry: Royal Arch. Its 1939 copyright is credited to Benjamine (aka Zain). The booklet I found is a reprint from 1960. 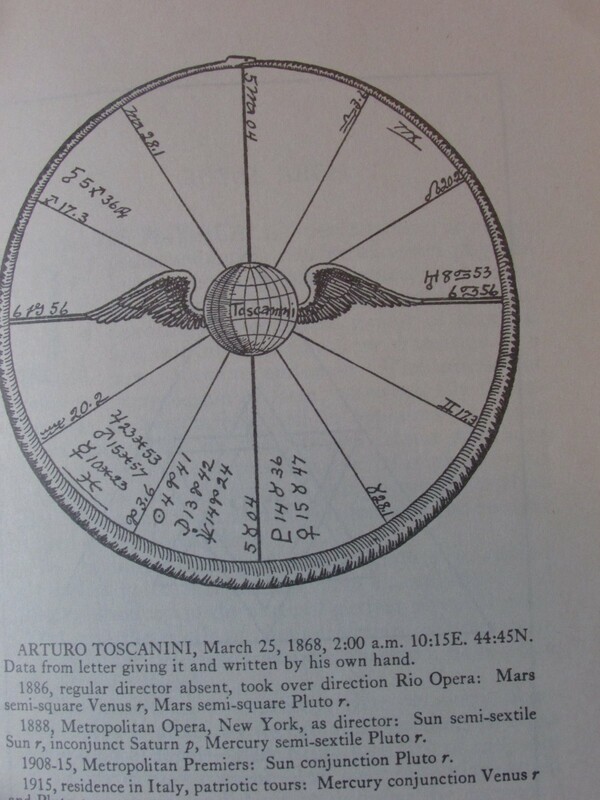 It opens with two images which I take to be astrological in some way. What’s most interesting about them is that they are examining the lives of two prominent figures who history has kept alive even to today. One is Major Edward Bowes, a famous radio personality from the 1930s and 40s. According to the booklet, the data provided on him was from his sister. The other figure is Arturo Toscanini, an Italian conductor. His data, intriguingly enough, is claimed to have been provided by the man himself. Why the astrological profiles of the two men are provided is a mystery to me. Nowhere else in the book are they discussed. Following the two mysterious profiles, the booklet opens with a general overview of the spiritual makeup of man. The physically perfect man, or adept, possesses and is master of seven physical senses, seven psychic senses, and seven states of consciousness. The number seven, denoting the complete gamut of physical life, indicates readiness for transition to a new octave of endeavor. The number of action and completion of form, astrologically it corresponds to Sagittarius; and it explained in symbolical pictograph by the Seventh Major Arcanum of the tarot, which represents the triumph over all temptations and obstacles of the physically perfect man. Upon this tarot arcanum is founded the ancient degree of the Royal Arch. — C.C. 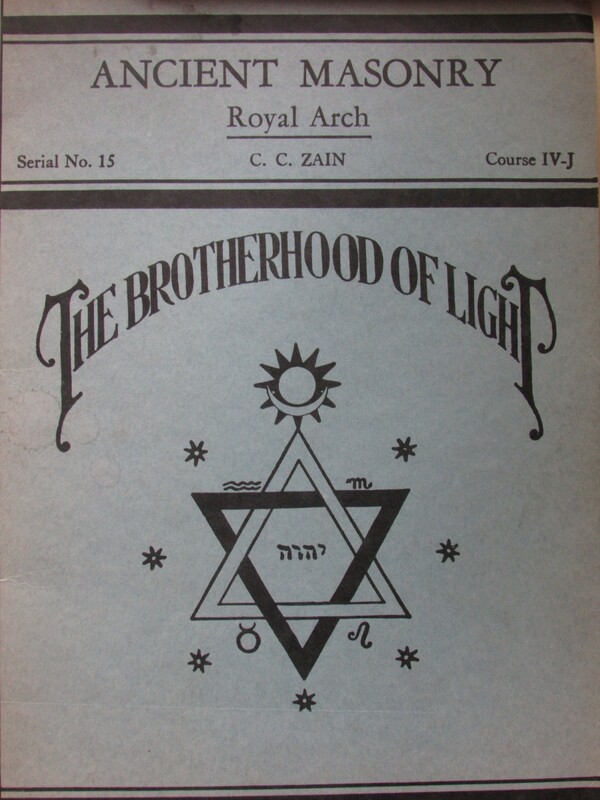 Zain, Ancient Masonry — Royal Arch — The Brotherhood of Light, p. 293. From there, the remaining pages detail a specific initiatory rite. It advises how to establish the setting and how to conduct the ritual (if ritual is the correct term they would have used, I don’t know). This is real nuts-and-bolts stuff. How many steps to take east, how many times to bow the head, etc. The CoL has all of the teachings found in my rare booklet available for its members and, I believe, for the public. So, my book sale artifact find isn’t necessary for someone interested in the CoL’s teachings as more than intellectual oddities. Yet, there’s a sense of history in this booklet. I feel it in lots of old books, but particularly in this one. I’d guess the first people to lay hands on this were by no means amateur hobbyists or simply aficionados of the abnormal. They would have been serious spiritual seekers living secretive inner lives marked distinctly apart from those around them. Participation in secret societies and unconventional religions was at some places, in some times, illegal. Building a group like the Brotherhood of Light was inherently risky, and in some cases extremely so. The CoL, meanwhile, may not have been secret, but it was, and is, by no means mainstream. Part of their own stated goal was to spread occult knowledge to the public. This is the kind of stuff fiery evangelical preachers denounce as Satanism just before gathering together their flock and arming them with pitchforks and torches. Yet, despite that, these folks believed in this work deeply enough to devote huge portions of their lives to studying, teaching, and publishing it. That’s an intense level of conviction and passion that I think few of us can understand today. At some point in history, someone read the booklet I’m now holding very seriously, very intensely, probing its secrets in a determined effort to find the key to the gates of Wisdom. That’s heavy stuff, and real or imagined, the hungry energy seems to seep out from the book as I read it. No digital reproduction could ever come close to replacing that feeling of history and psychic strangeness in my hands. This is the stuff that makes book collecting worth it. This is what I love about it. So, add the Brotherhood of Light to the Servants of Awareness and a half-dozen other bits of weird American history that I’ll obsessively investigate over the coming months. The Ancient Masonry — Royal Arch booklet provides a fascinating glimpse into American occult history. For those who practice such things, it offers a manual of instruction for an initiatory rite. The real value of the book for me, though, is as a historical artifact. I can feel time in my hands as I read it, and exploring the places and people in its pages made new connections in my ever-present quest to put together America’s history of occult organizations. If you’re into similar subjects, I advise either tracking down these booklets on ebay or Abe’s or going to the CoL website. Very, very interesting stuff, space cadet. As always, happy weirding, friends. Happy weirding.